Here are some facts about the River Tees. The River Tees in northern England has its source in the Pennine Hills on Cross Fell and flows into the North Sea near Middlesbrough. It is 85 miles long. One of Britain’s most famous long distance footpaths traverses Cross Fell. Walkers on the Pennine Way walk a few yards from the source of the river. The River Tees once formed the boundary between the English counties of Durham and Yorkshire. The river’s source is in Teesdale, an area designated as one of outstanding natural beauty. The most famous bridge on the Tees is the Transporter Bridge. It is the only bridge in the UK where bungee jumping is allowed. 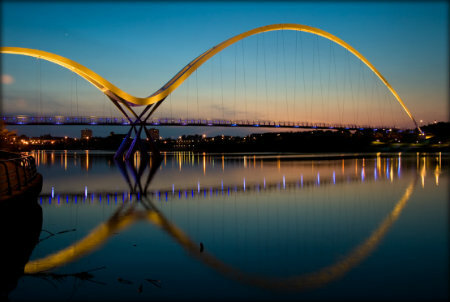 Another well known and unusual bridge over the river is the Infinity Bridge in Stockton-On-Tees. The bridge (together with its reflection) looks like the infinity symbol and changes color at night. High Force in the Pennines is a waterfall on the River Tees. The water drops 170 feet and the falls have been in many movies and TV shows. Anglers using the River Tees enjoy fishing surrounded by some of England’s most beautiful scenery. Although some fishing is free, the best stretches are owned by angling clubs. One of the largest towns along the Tees is Middlesbrough, which owes its existence to the river. The town is the birthplace of the explorer Captain Cook and has a large collection of Picasso paintings. Teesport, near the mouth of the River Tees, was built on land reclaimed from the sea. It is now one of the busiest ports in the UK. Despite the heavy industry near the mouth of the river, the estuary is an important habitat for animals and plant life. Seals can often be seen on Seal Sands. What next? Discover more river facts and find out more about some of the other UK rivers by visiting our rivers resources page. I found this very informative, it really peaked my interests…good job James!